It's always a treat to stop by Cascade Brewing Barrel House. You never know what special treats they may have lurking in the barrels behind the bar...unless, of course, you get regular emails telling which special beers are being poured. And when. Last Thursday marked the annual Four Goses of the Apuckerlips event. Gose (pronounced gose-uh) is an historic, sour wheat beer. Each of Cascade's four Goses is designed for a season. They are light and just slightly sour. Each one is brewed with sea salt and various spices and they all come in around 5.5% ABV. They were pouring Spring Gose 2011, spiced with wild chamomile, lemon peel and culinary lavender; Autumn Gose 2010, spiced with cinnamon, nutmeg and orange peel; Summer Gose 2011, spiced with coriander; and Winter Gose 2011, spiced with rose hips, orange peel and cinnamon. These were all good beers. 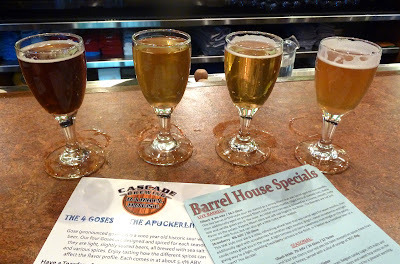 I am a big fan of the Cascade beers, especially the ones that don't exert ultra-tart flavors. The Gose beers are all pleasantly sour, light and crisp. It makes sense. These are wheat beers and the ABV is near session level. Each of them is tasty and highly refreshing. My favorite, for what its worth because opinions are going to vary, was the Summer 2011 Gose. It's creamy smooth body and mellow spices are followed up by lingering and dusty lemon finish. "Hey," I thought. "I could drink a lot of this stuff on a hot summer day." Wait, I could drink a lot of it almost any day. I continue to be impressed with the blending and aging program they have going on at the Barrel House. Lots of other breweries are playing around with barrel-aging and blending. But no one, to my knowledge, is doing it on the scale that it is being done here. Not in Portland.